The driver of a plumbing truck joined a chase involving another pickup Thursday morning on narrow and winding streets northeast of downtown Los Angeles. 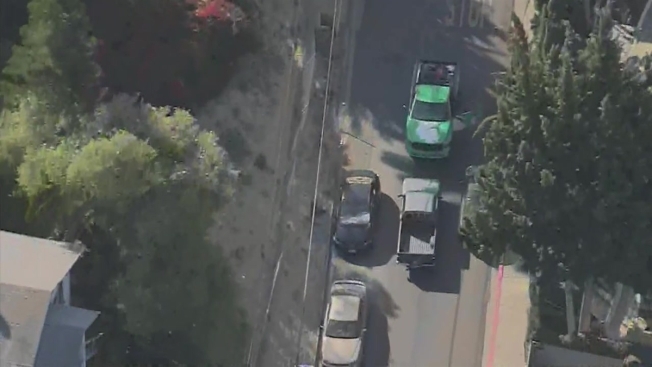 The chase began in the Altadena area after officers responded to a man who called authorities from several locations saying that he needed some type of medical assistance. The driver sped away when officers first found him on the 210 Freeway in the San Gabriel Valley. Officer continued following the driver on the 210 Freeway before he exited onto streets in the Eagle Rock and Glassell Park areas northeast of downtown Los Angeles. The driver came to stop with officers behind him outside a house at about 8:30 a.m., refused to get out, then took off again. He encountered an unoccupied green and logo-emblazoned pickup belonging to the Right Price Rooter service parked in the middle of the street, but squeezed between the truck and another vehicle to continue into the hillside neighborhood. The plumbing pickup driver could be seen running from a nearby property to the pickup before chasing the driver for several blocks. NBC4 has reached out to the plumbing service for comment. The chase eventually came to a stop in the 3100 block of Weldon Avenue and a standoff ensued when the driver entered a house. At least four people were escorted by law enforcement officers from the house. The man's brother told NBC4 he was recently hospitalized and planned to turn himself in, which he did early Thursday afternoon. "We were there to determine whether he was a danger to himself or others," said LAPD Officer Liliana Preciado. The driver was arrested on suspicion of felony evading.